Summary: This film is a significant anti-war statement, and one that deserves your time and attention. 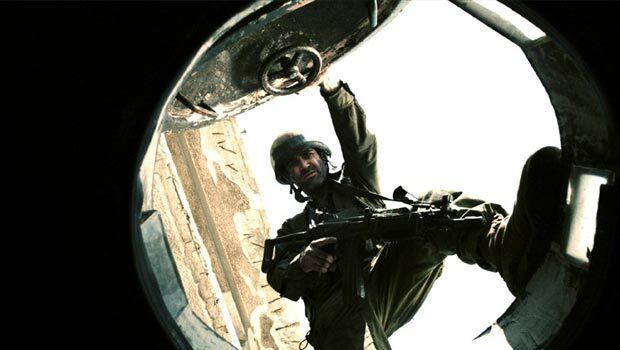 After a few brief credits, Lebanon begins with a porthole opening and a soldier climbing into a tank. We’re watching from inside, along with the three other young and inexperienced men that make up the crew. Apart from one notable exterior shot, our perspective will be limited to what can be seen and heard from within this tank for the duration of the film. From this simple and restricted set-up, Samuel Maoz, who nearly 30 years ago was a gunner in an Israeli tank just like this one, builds a compelling, intense and surprisingly layered film experience. If the prospect of being stuck for 90 minutes in a tank with four guys, none of them particularly conversational or charismatic, doesn’t have you beating a path to the nearest cinema you’re certainly not alone, but this is a film that is worth the effort; it rewards investment. Maoz doesn’t use this limited perspective as a gimmick or a merely interesting concept, but rather he uses it to build a very effective case against war as a reasonable human endeavour. From this perspective, it is difficult to see how any war can have any result other than disaster. The film begins at nighttime, and text on the screen tells us it is 1982, the first day of the first Lebanon war. This is all the information we get, and it soon becomes shockingly clear that this is pretty much all the information that anyone on the front lines of this army has. A commanding officer comes into the tank with a seemingly clear set of orders, but as soon as an engagement begins, and we see glimpses of the chaotic conflict through the terrified gunner’s crosshairs, it is intensely apparent that there is no plan, just people being killed. Maoz structures the film episodically, subtly shifting his focus around each of the four men to gradually add layers of development and place us firmly in each moment, provoking us to think and feel at all times. Perhaps it’s not surprising that the most powerful moment comes through the eyes of the gunner, as he watches a distraught Lebanese woman step out of a burning building that he has just reluctantly pulled the trigger to destroy. We are watching through the same crosshairs, strongly feeling the powerless rage of injustice on both sides of the gun. The fact that Maoz gives virtually no context is both a strength and a weakness; it allows his film to be about war in general, and means that an audience with no prior knowledge of the Lebanon war can immediately grasp the issues being addressed. By the same token this approach leaves Maoz open to criticism, as his film doesn’t actually shed any light on the wider political reasons for this fight, arguments that remain unresolved today. With its confined location and small cast the film feels at times like a play, and this feeling is borne out in Maoz’s dialogue; when characters speak there is meaningful weight to their words. Equally significant are the recurring extreme close-ups of the tank’s various dials and metal surfaces, which crumble along with the minds of the men the deeper they become entrenched in chaos. Maoz’s skill in marrying technical and compositional skill to thematic intentions belies his film’s micro-budget, and Lebanon is arguably as insightful a portrayal of men in war as the considerably more costly Oscar-winner The Hurt Locker. This film is a significant anti-war statement, and one that deserves your time and attention.